The last week has been one of the most intense, challenging and fun weeks in my short running history as I joined up with the rest of the Berghaus Trail Team for 3 days mountain running in Chamonix. Like my fellow Trail Team friends, Danny Wood, Kirstie Smith, Kirstie Reade and no doubt Martin and Graham, I feel a little overwhelmed when I think about last week and everything we were lucky enough to experience and learn from our hosts and guides. 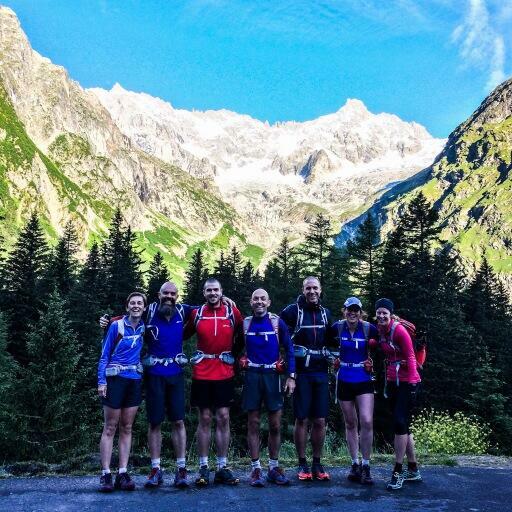 We had 3 big days planned for the Chamonix trip and as a team we covered around 95km running with a lung and leg busting 18,000ft of ascent and descent thrown in. Our guide Julia kept us moving and I’m pretty sure I wasn’t the only one who found the terrain, altitude and distance testing but we all moved well considering we were 6 strangers with differing running backgrounds but eventually after 3 days running and hiking we were lucky enough to all finish together at the end of a great downhill. I spent a lot of time running with my mouth agape and my jaw constantly dropping at both the scenery, the fun I was having with the people I was with and how lucky I was to be there and there’s so much to digest so the plan is to split the trip down into a few more manageable posts covering the days and lessons and tips I got along with some of the excellent Berghaus kit we are all reviewing and testing. Shortly I’ll be writing about how I thought my lungs felt like they were on fire the first morning running at 1700m, how I found that descending long and technical alpine single track is such a joy, how a couple of hundred meters of steep climbing with poles made me a convert, how I can train smarter, eat better on the run and how I much fun glissading down a snowfield at 2500m is. In the meantime, since I’ve come back and spoken with friends and fellow competitors at Man Vs Barge, it’s great that I get a chance to talk more about a hobby/sport I’m so passionate about and share the things I’m learning as I go. It’s clear that running is becoming more of a lifestyle for me personally and I love everything about the sport, the training, the goals, the equipment and racing and also as someone who used to be incredibly shy to the point of barely speaking to people I didn’t know – running has given me confidence beyond what I thought possible and being chosen to join and share our Trail Team experiences is something I can’t wait to do.